You can hover your mouse or pointer to view the Jet Bandsaws and click on them. You couldn’t make a better choice than a Jet for your busy workshop and you are not limited to just one saw but a range of them which I have placed below beginning with the smaller woodworking machines. I will give you the basics of each saw because their full features are displayed when you click on the links. I don't like repeating myself, ,myself. You are probably aware of the good reputation Jet machines have formed over the years which is probably why you have arrived here. 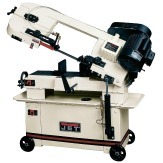 I regularly search for the best value for each Jet bandsaw quoted and as you will notice there are a few suppliers. The carousel at the top shows band saws available from Amazon. The majority of those below are from competing distributors. Tool King are priced in $’s and £’s. Depth of cut 3⅛" and width to 9"
Cutting height of 6" and width of 13½:"
Table size of 14" x 14"
The JET 710116K JWBS-14DXPRO, 14-in Deluxe Pro Band Saw Kit is best priced at CPO JET and Amazon at $ 999.99, whereas at Northern Tool it is $ 1,099.99. Cutting depth of 12" and width 13½"
45 degree Right tilting table of 15" x 15"
Cutting height of 6" and width 13½"
Cutting depth of 12¼" and width 18⅜"
Priced at $1,939.99 £1183.26 at Tool King, CPOJET, Tyler Tool and Amazon. And if you fancy a machine providing assistance on heavy production this will save you hours of standing by the machine. There is a price to pay though which is $10,999.99 from CPO JET, but it has increased in price by $1350.00 since January. And that just about wraps it up for my selction of the Jet Bandsaw. You can see from their variety, that Jet make machines for everyone's requirements. I hope you find what you are looking for and wish you many happy hours of bandsawing ! !